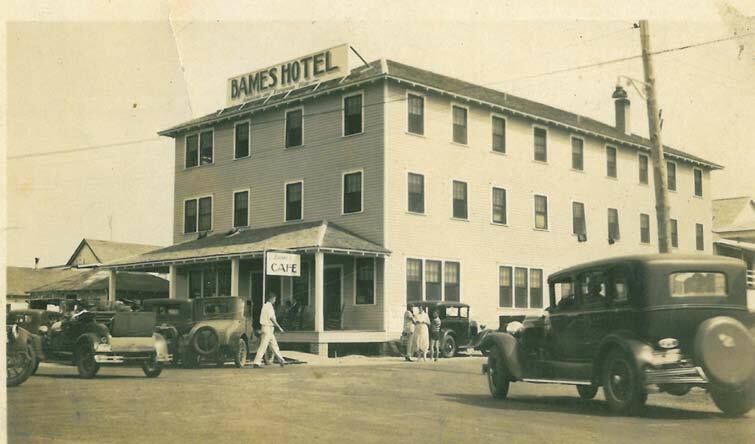 After the original wooden Bames Hotel burned down in September 1940, we rebuilt it with a brick one. Later, and after so many of the family died or moved away, the oldest son George died. George was managing the hotel because the other two boys had the grocery store and the service station. When George passed away, my husband Ernest, and his brother had their own businesses and they just couldn’t manage the hotel; they didn’t want to mess with the hotel. So they leased the hotel to a minister and his wife, the man had retired. My husband, it was after his brother died, and the other brother didn’t want to worry with it. 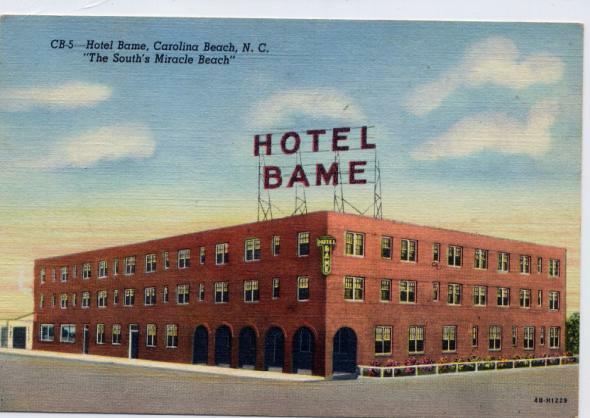 But when my husband went in and saw the condition the hotel was in, he said it would ruin the name, so he had it [the second Bame Hotel] torn down. And that’s where the Marriott Hotel is located today – on that property. It had just gone down. Hurricane Hazel. It really took my husband’s business – the Gulf station and the appliances. 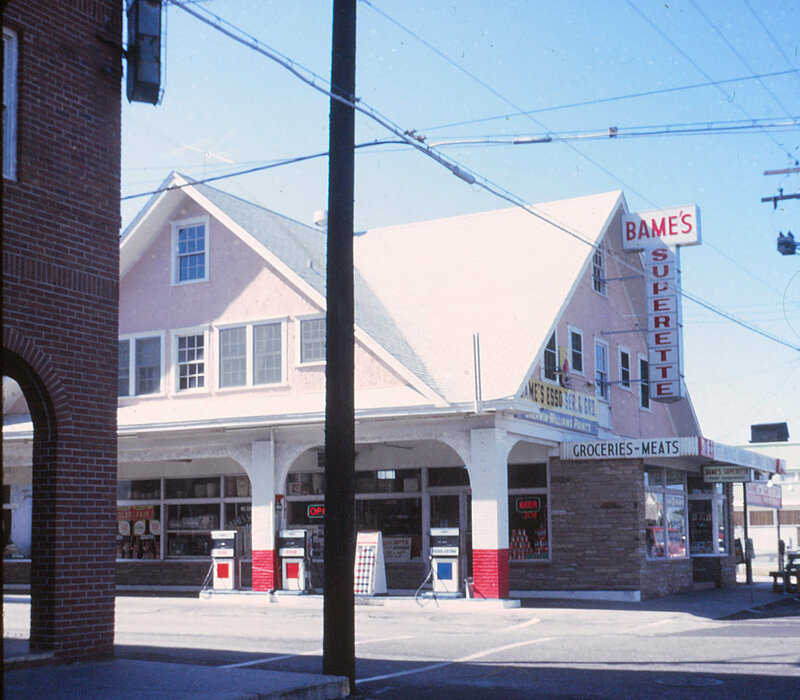 During Hurricane Hazel, he stayed down at the business, I was living at the corner of Hamlet Avenue at the time. I wondered if he doesn’t come home…. During the height of the hurricane the ocean and the canal were almost ready to meet. And it did eventually. And he was trying to save the appliances. He had just put in a car load of GE appliances. And they stayed down there and tried to save those appliances until it just got hopeless. The building was almost demolished. That’s another reason they had to get rid of the hotel – so much water came in. All that area just flooded something awful. I think I mentioned the banker’s wife – we were playing bridge and heard the report that the hurricane was coming and she left. Later, when I heard she had lost everything, we left our home on Hamlet and went up to the brick house on Cape Fear. When my friends on Canal Drive lost everything, we went up and dug clothes out of the mud. I took them home and washed them. That was a sad, sad time. I had a dear friend who was one of the supervisors in the school system that lived on the southern extension at Carolina Beach. Had a nice home. And do you know after the hurricane Hazel, we found her buffet on the school lot. Everything was gone. 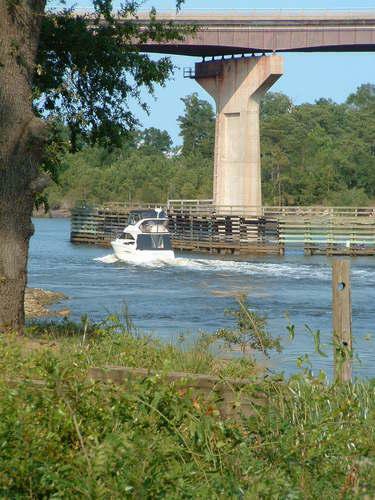 The original builder of Echo Farms had a beautiful home on the southern extension – a nd he loved the beach. He was getting on up in age. Do you know during the hurricane he went into a shower stall, he wouldn’t leave. His home and everything was destroyed and he was left in the shower still alive. Now that was an experience that not any of us will ever forget. Snow’s Cut Bridge. Well I do know that they were responsible for us having the bridge. My husband and Mayor Alsbrook from Wilmington and some of the county commissioners made a couple of trips to Washington. They really worked to get that bridge because that draw bridge was a handicap. And at that time, a lot more small yachts were coming into this area. Which is good. We needed that bridge. They were very interested in getting that done and they worked with the state. Churches. There wasn’t much social. The churches – the Baptist church and the Methodist church and the Deck House used to be the Presbyterian Church. It was a very active church. The churches, we had good groups. 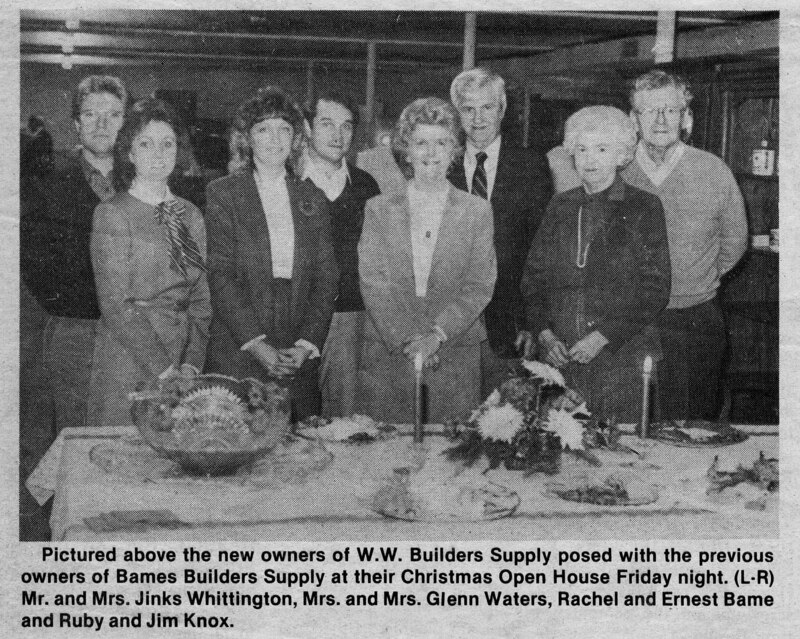 When we built the brick church, the Methodist church, the women of the church worked so hard to help finance that building. We used to have conventions on the beach. Oh the biggest group of people would come to the beach. And our women of the church would serve meals to make money to help build that church. We would serve sometime 200 people, we did work hard. The Library: Let me mention one thing that was important to me at that time. We had a Women’s Club which was, you’ve heard of Sorosis in Wilmington? The Sorosis helped to organize the women’s club and that’s when we built our first little library on Carolina Beach. Our Women’s Club was responsible for that little library. It was where it is now. It was a little wooden framed building that the town let us use and we worked on it. And the Wilmington Library came in and helped us. That was in the late ‘50s. It was strictly volunteers. We did have one elderly member of the Women’s Club, Mrs. Flogger. She was wonderful. And she volunteered her time – full time at the library. And that was a good thing. We got the books through the Wilmington library. It was affiliated. That was a good thing that we had for the beach. We needed that badly. And I did volunteer work there during the time. Britt’s Donuts Speaking of Inlets… What Do You Think?